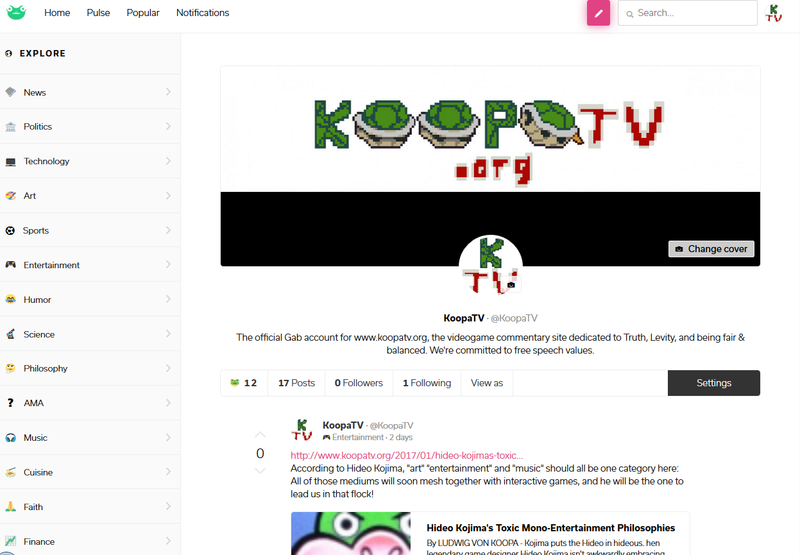 KoopaTV: KoopaTV is now on the GAB Social Network! At this rate, there'll be too many social media accounts to track! Tumblr? Ello? MySpace?! GAB?! The typical average person would only have accounts for Snapchat, Instagram, and Twitter (whereas Instagram is, in my opinion, overrated, and doesn't even work on desktop). Have you ever considered settling down? Or do you truly believe in expanding your territory, and its positive effects? The MySpace one was an April Fools joke parodying our social media profliferation, and isn't actually used! I believe that each platform has its own user base, and we can theoretically take the time to tailor our postings to get views and fans from them. In practise, this doesn't happen because I dunno how to use social media, but low-effort right now has a low marginal cost to it.